Although close to Ios, Sikinos could hardly be more different. Until recently you had to take a launch from the ferry boat to get ashore and it wasn't too long ago that donkeys were the main transportation. The island has a lovely little port and two attractive villages standing sentinel high above. This island has not been touched by organized tourism and many of the locals still make a living from fishing and farming. A great place to spend a few days as an antidote to the fleshpots and overt commercialization of the busier Cyclades. 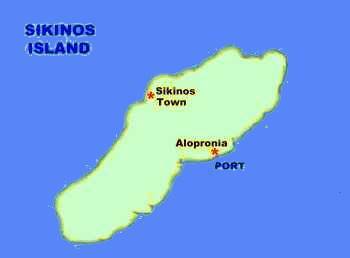 Sikinos - the antidote to tourism. Easily the most visited and famous of the island chains. Each summer thousands of tourists take the ferry boats as they ply between the numerous islands that make up the Cycladic group. Santorini and Mykonos take the lions' share of visitors - who come to marvel at some of the most impressive views in the Mediterranean or revel in wild night life. But the enduring benefit of these islands is their proximity to one another - thus island hopping has become an established pattern. While many desire nothing more than to drift around the Aegean until an island takes their fancy others are intent on seeing as many as possible during their stay. With such a rich array of uniquely different choices the Cyclades look set to remain the destination for visitors who want to be able to experience the crazy, the quiet, the famous, the historic, the beautiful and the exotic - all in a week.